The family comprises of herbaceous annuals growing as weeds in the cultivated fields and as well as in the forests as under-growths. E.g., Chenopodium album also known as Pigweed or Bathu belongs to family Chenopodiaceae. 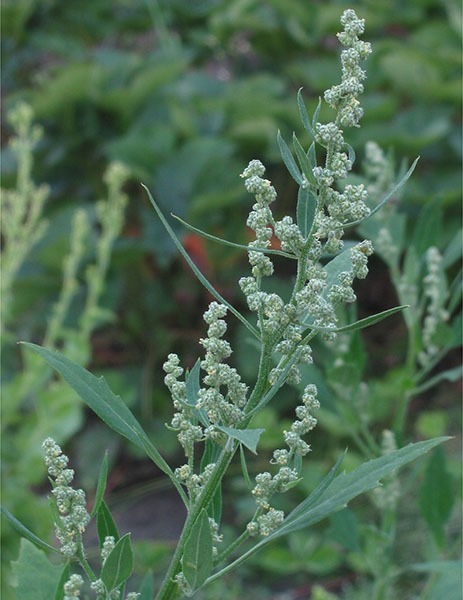 Chenopodium album is a common annual herb found as a weed in wheat fields. The tender twigs are used as vegetable and fodder. The perianth is not differentiated into calyx and corolla. Erect, branched, angled, green, red, purple. Leaf is Cauline and ramal, Exstipulate, Petiolate, Simple, Alternate, Venation: reticulate unicostate. Cymose- A condensed cyme, forming axillary spikes. Bracteates Sessile, Complete, Pentamerous, Actinomorphic, Bisexual, Hypogynous. 5 Perianth leaves, Polyphyllous, Green, Inferior. Bicarpellary, Syncarpous, Ovary: superior and unilocular with a single basal ovule, Placentation: basalt Stigma: bifid. Some species of the family are grown for ornamental purposes such as summer cypress, Kochia scoparia and Kochia trichophylla. The members of Chenopodiaceae are of considerable importance for food. Because of the succulent nature of the young stems and leaves, and the lack of the objectionable flavor this family surpasses all other for “greens” (vegetables). Spinach (Spinacea oleracea). Suaeda fruticosa (Seablite, vern. Saloonak Buti). Wild under-shrub, branched, common in saline soils, often gregarious; leaves sub-sessile, succulent, green purplish. Sajji is prepared from its ash, also used as fodder for the camels. Salsola (Saltwort). Name from the Latin Sal-salt, from the salt in which it abounds. Salsola baryosma old name. Salsola foetida (Saltwort, vern. Lana). Wild, densely branched hairy undershrub common in saline soils; leaves crowded minute, fleshy. Sajji is prepared as the whole plant abounds in alkali salts. (Beet). Beta vulgaris (Beet, vern. Chakundar). Cultivated for its thick tap root from which sugar is extracted; leaves radical; red sap of the napiform root is used as a dye. 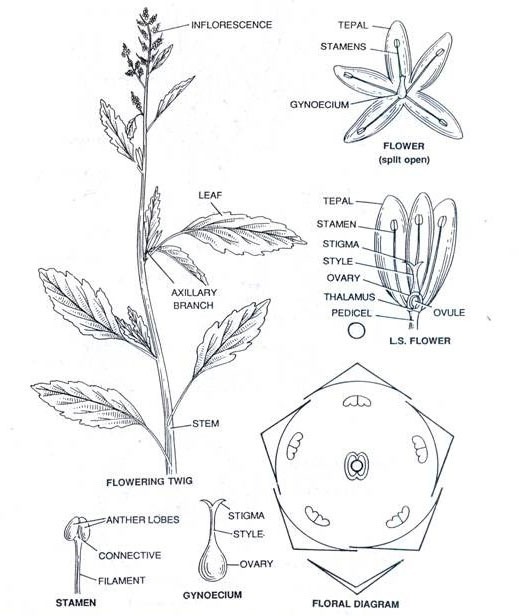 Flower differs from that of Chenopodium spp. in the base of the perianth being thickened and ovary being sunk (perigynous) in the fleshy disc and in the presence of both bracts and bracteoles. Beta Vulgar is var. rapa, ethe Suger Beet is a plant of great economic importance. It is biennial and forms in the first year a thick swollen root bearing a bud consists of a thick-stalked, entire, succulent and often crisped leaves. From the midst of this rosettle of leaves arises in the second season a much-branched panicle, bearing small greenish flowers, each with three carpels. The root abounds in cane sugar at the end of the first season as reserve material and it is extracted at this stage. By constant selection the percentage of sugar is raised from 7-80% to an average of 15%. It is cultivated extensively in Germany. France and Europe for the manufacture of sugar. Spinacea oleracea (Spinach ver. Palak). cultivated, leaves used as vegetable (Sag); flowers polygamous. Spinacea glabra, the summer spinach, is used as a vegetable.